Grow to your full potential in business and win at life. Hi, I’m Dave Gobeille. Can I help you succeed? Free 30 minute conversation over the phone to see whether we're a good fit for each other or not. We will define a personalized plan about how to overcome growth-restricting obstacles and blindspots. After receiving the clarity, confidence, and tools you need to win at work and succeed at life - it's time to implement them! 1. Increased financial freedom. 2. Greater balance in your life and business. 3. A developing culture of success, focused on serving the needs of others. 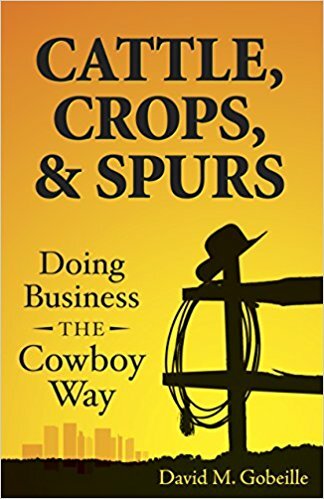 In Cattle, Crops, & Spurs, I draw principles from the Ten Commandments and the Cowboy Code and expand on them with anecdotes from my ranching experience. The result will challenge leaders of all stripes, whether city folk or ranchers at heart, to transform their lives and the cultures of their businesses. Men aren't as involved in churches as much as they could be - why is that? In fact, many aren't involved at all. If you're ready for the men in your church to step up, to change and grow host a group and download the study guide today.